Darren Wilson, the Ferguson, Missouri police officer who shot and killed unarmed black teenager Michael Brown in August, reportedly has no regrets about his actions. Apart from transcripts of Wilson’s testimony that were released Monday night after a grand jury declined to indict him, he has not spoken publicly about Brown’s death. However, ABC News anchor George Stephanopoulos talked with Wilson on Tuesday afternoon and shared some of what Wilson told him in a special report announcing the interview. “He says he has a clean conscience over his actions that day even though he’s sorry for the loss of life and understands the grief of Michael Brown’s parents,” Stephanopoulos said of Wilson. 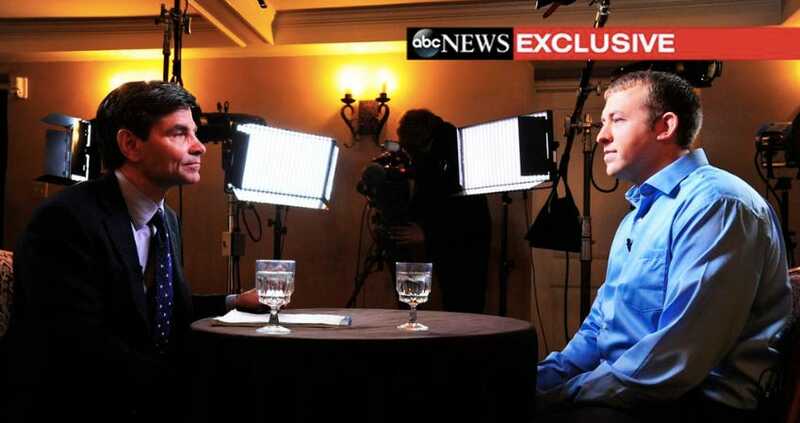 According to ABC, the interview is scheduled to air Tuesday evening on “World News with David Muir” and “Nightline.” It will also be broadcast on “Good Morning America” on Wednesday. “Officer Wilson said he does not think he could have done anything different that day,” said Stephanopoulos in his special report. Wilson shot Brown in August after stopping him and a friend for walking in the street. Witness accounts of the shooting vary significantly. Wilson claims he shot Brown in self-defence, he told investigators there was an altercation in his police vehicle and Brown grabbed his gun. However, other witnesses have told a different story and said Brown had his hands up in a sign of surrender and was running away when he was shot. Protests broke out in Ferguson, a St. Louis suburb, after the shooting. Demonstrations picked up again Monday night after officials announced the grand jury decision. Buildings and police cars were set on fire, and some stores were looted.